Proponents of transit-oriented development [TOD] have long been challenged to demonstrate how TOD projects, and sustainable development more generally, might address issues of social justice. Although there are many examples of TOD projects that are environmentally sensitive and economically successful, there are few that are also considered socially equitable. The Fruitvale Transit Village in Oakland, CA stands out in this regard. The village has the hallmarks of traditional TOD such as mixed-use retail and housing with access to train and bus lines, but what makes Fruitvale a frequently invoked case study in socially equitable development is the addition of community resources such as a senior center, library, Headstart preschool, and medical clinic. From a planning perspective, this clustering of transportation, affordable housing and social services furthers the goal of social equity—enabling low-income residents to remain and thrive in central city neighborhoods, while also reducing energy consumption and emissions caused by cars. However, Fruitvale could serve as a better example for future socially equitable development by emphasizing the process through which it was built rather than the details of its design. 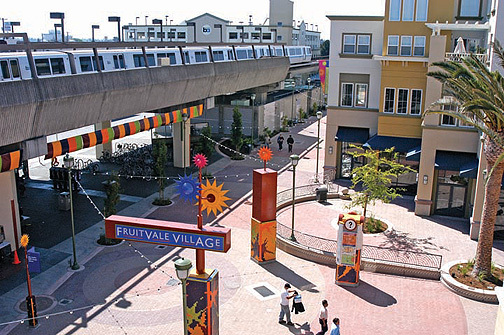 When it opened in 2004, after more than a decade of planning, several newspapers, environmental groups, and government officials from across the country immediately hailed the Fruitvale Transit Village as a model of socially equitable transit-oriented development. The Sierra Club named it one of the 12 best new development projects of 2005, the National Resources Defense Council named it the best land-use project of 2004, the Environmental Protection Agency cited it as a “best practice” for social equity in transportation design, and the U.S. Department of Transportation called it one of the three best case studies in environmental justice. The project also earned awards as the National Association of Homebuilders Best Mixed-use Community in 2003 and 2005, and the San Francisco Business Times named it the project with the Best Community Impact in 2002. When it first opened, Norman Mineta, the U.S. Secretary of Transportation, came out to say congratulations. Before the first resident had moved in, before the first clients or the first customers walked through the clinic and storefronts, the Fruitvale Transit Village was already considered a success. However, it is not solely the presence of service amenities in and around the station that makes Fruitvale a good case study for equitable development. The village, which was created through long-term local political activism, should also serve as a symbolic victory for community participation in transit development. In 1991, the Bay Area Rapid Transit agency (BART) proposed a parking expansion to the Fruitvale stop. The multi-level garage threatened to further block neighborhood traffic from International Boulevard, the main commercial artery for the area. Community protest, marshaled by the non-profit Unity Council, met with rare political success. BART, the City of Oakland, and the Unity Council embarked on a community input process that took nearly four years and hundreds of thousands of dollars. By 1992, the City of Oakland awarded the Unity Council $185,000 in Community Development Block Grant (CDBG) funds to initiate a community planning process. In May 1993, Unity collaborated with UC Berkeley’s National Transit Access Center (NTRAC) to sponsor a community design symposium at which architects translated ideas to participants for the station areas. The Unity Council hosted three events to collect public input. Each meeting attracted 30–60 people. In April 1993, U.S. DOT awarded a $470,000 FTA planning grant for a series of community workshops, as well as economic, traffic and engineering studies. This input process resulted in a radically reimagined station design. What started as a proposed parking garage emerged as a paragon of community planning and socially conscious development. Fruitvale is an important case of TOD—but also one that is difficult to replicate. Complex legal and financial arrangements, and years of political activism and public involvement brought the project it to fruition. Yet, as the Fruitvale Station circulates through planning and development literature as a case study in equitable development, it is noted for its design elements rather than its community-led participation process. Indeed, the political and community organizing of the kind that produced Fruitvale, and that arguably is crucial to the success of equitable TOD in general, is little recognized in mainstream planning literature, which tends to be technocentric and depoliticized. This lack of attention to the complexities of public participation is particularly troubling as there is a growing concern about gentrification and displacement in transit-rich neighborhoods. Research on the effects of TOD on neighborhood change show that new transit stations can make housing more expensive and displace low-income residents said to benefit the most from better access to public transportation. Early and sustained community participation in TOD planning and implementation is crucial to addressing the potential benefits and risks for residents. As more municipalities look to strengthen their public transportation systems, and make them and the development around them more equitable, the Fruitvale model will continue to be invoked as a case study. However, future projects will need to find ways to marshal community input into a shared vision, while bringing in the financial resources and political energies necessary to make that vision a reality.